I told you last week that I'll be doing a few "spotlight" posts on my favorite healthy grocery store purchases, and I started with whole grain english muffins. Well, I'm going backwards with this next spotlight, because it doesn't actually involve a store-bought product. I thought that salad dressing would be a great thing to highlight since we're in the perfect salad season and I eat them all the time. But... my favorite salad dressing is not purchased from the grocery store -- I make my own salad dressing 95% of the time! If you're still buying dressing off the shelf, you may want to reconsider... making your own is easy and so much better for your body AND your wallet. While it's one thing to have a favorite "splurge" bottled dressing (I have to admit, I LOVE Brianna's Asiago Caesar), if you eat salads as often as I do, it makes so much more sense to make your own. Why? What's wrong with bottled dressing? Would you pour a "vegetable oil blend" all over your fresh salad greens? Could you see yourself drizzling cottonseed oil or palm oil over your salad? Probably not. But that may be exactly what you're doing with bottled dressing. While most of us would prefer to use heart-healthy oils like olive oil, bottled dressings rarely include these because it costs too much. Check those ingredient lists. The more natural and healthy dressings that include olive oil or canola oil as the first ingredient are probably your best choice if you're going to buy bottled. However, even these include some questionable emulsifiers and preservatives (some xantham gum and sodium benzoate on your fresh greens, anyone?). Plus, many bottled dressing also include MSG which is so not necessary. I know many health conscious people choose low fat or "light" bottled dressings. While these MAY be a better alternative in some cases, you really want to be mindful of what's in these dressings. Often, sugar or artificial flavor is added to make up for the lack of fat. And don't get me started on fat free. I'm sorry but fat free ranch just doesn't make sense -- what IS that?! You're much better off adding some healthy fat to your salad rather than some unnatural, chemically-laden fat free mixture. Why shell out 3, 4, 5, or 6 dollars on a bottled dressing? You're paying for cheaper products (see oil discussion above) when you could make a much higher quality (and tastier, IMO!) dressing at home for a fraction of the cost. You most likely already have everything you need at home to make your own without spending any extra money. 1. Use a ratio of approximately 3:1 oil to vinegar. You can play around with this. Sometimes I'm heavy-handed on the vinegar because I love the acidity, but you need enough oil to balance things out. For oil, extra virgin olive oil is your best bet for dressings. As for vinegars, choose your favorite! I usually use balsamic, red wine, champagne, apple cider, or rice wine vinegar depending on the flavor I'm going for. Chopped fresh herbs, lemon or lime juice (which can also replace some of the vinegar), honey, dried herbs, chopped onion, parmesan cheese, minced garlic, poppyseeds.... the possibilities are endless! This is where you can really be creative and make a super delicious dressing. 3. Stop there, or include an emulsifier. I don't mind my oil and vinegar separating, but if you do, add an emulsifier like dijon mustard or egg yolk. Mustard is one of my favorite flavors to add to a salad dressing and it does a great job of keeping everything together with a smooth consistency. Sometimes I'll add greek yogurt, which adds a creamy consistency (but doesn't emulsify the ingredients as well). That's it! Whether you're making 2 servings (3 tbsp olive oil, 1 tbsp vinegar) or 15-20 servings (1 cup olive oil, 1/3 cup vinegar), this is a pretty fool-proof method. If you're making several servings, pour it in a sealable jar (like a mason jar). Think you don't have time? Come on -- whisking together a few ingredients in a bowl takes nearly no time at all... it doesn't have to be a complicated process! Or, if you're REALLY in a hurry (which I am sometimes), just drizzle some olive oil and balsamic vinegar over your salad separately. Easy. Flavor. 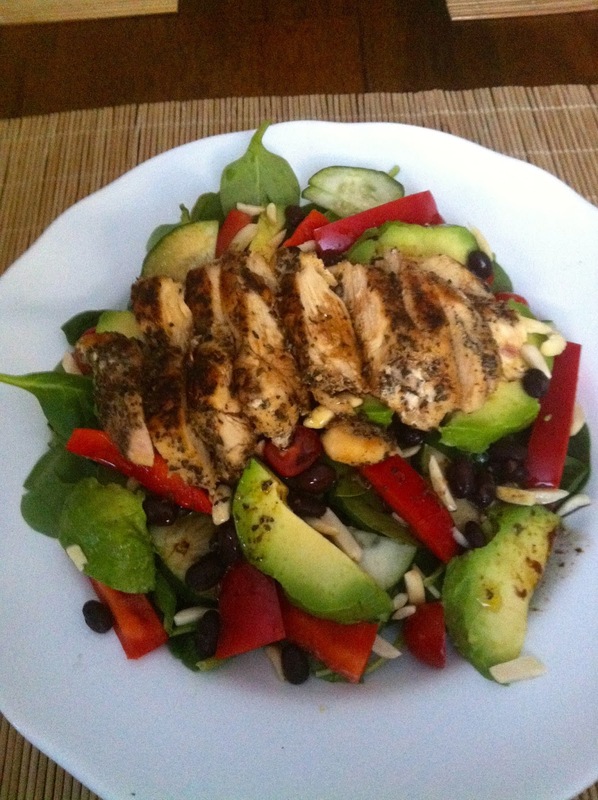 Pour homemade poppyseed dressing (made with just EVOO, apple cider vinegar, honey, and poppyseeds) over a strawberry, spinach, avocado and chicken salad. Mix together olive oil, champagne vinegar, greek yogurt, honey and dijon mustard. Pour over arugula, quinoa, chicken, avocado, sautéed veggies and goat cheese for a super power salad. Go back to the basics with this simple mediterranean chicken salad topped with a dressing prepared with olive oil, balsamic vinegar, lemon juice, and herbs. So... if you weren't already making your own salad dressing, are you convinced yet? totally convinced! I make my own sometimes, but not all the time, but this is pretty compelling - plus, they always taste better homemade!